Kollaboration DC Showcase Flash Sale! We are offering a special FLASH SALE DISCOUNT for tickets to the upcoming Kollaboration DC 2015 Showcase ft. Sam Ock! Now through 6PM EST tomorrow, Saturday 8/1, ALL TICKETS (including VIP and Premium packages) will be 15% OFF! Use limited time code "KDC15OFF" and get your ticket at: BIT.LY/KDC6TIX. This offer is only available for a limited period, so be sure to act now to get your ticket at the best price available! Finalists: Alicia Rae, Santa Jaca, Abby Rose, Audrey, 2Parkz, and Nan! 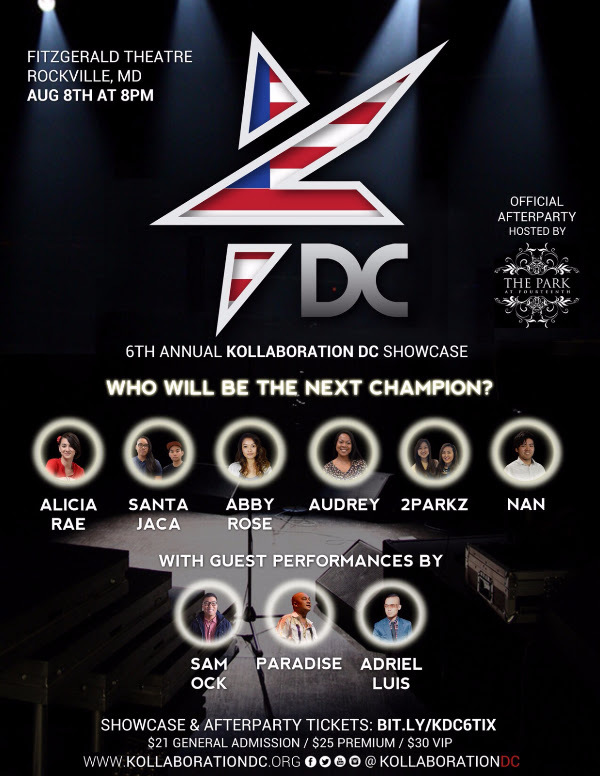 Come see six of the best up-and-coming artists and musicians of the DMV compete for the title of Kollaboration DC champion. The winner from the DC competition advances to the Kollaboration STAR event in Los Angeles, to compete against champions from around the country for a $10,000 grand prize.